The Way We’re Managing Projects Is Changing - Are You Ready For it? The Way We’re Managing Projects Is Changing – Are You Ready For it? What are the biggest trends impacting how digital agencies deliver work—and how can you deliver better in changing times? Our processes, platforms, and prerogatives are shifting under our feet, subject to our rapidly changing environment. What does this mean for the digital agencies of today? It means that, in order to thrive, we’ve got to keep our eyes trained on the trends, learning new methods and practices that will serve us as we move into the future. Whether you’ve got a VR headset or you’re still holding onto your VCR, the reality remains the same: you’ve got to tune into the new ways we’re delivering projects. Whether you like it or not, it’s going to influence the way you approach, execute, and deliver work. Ask yourself: Are you on top of the delivery trends that are influencing how your agency works? What concrete actions are you taking to adapt? This article explores 3 major trends that will impact your agency, the impacts of these trends, approaches for staying relevant in changing times, and where you can start. The growth of the digital industry has spurred numerous methodologies, frameworks, principles, and standards for accomplishing digital work. Some work well for pure play software development, while others are better suited to maintenance work. Others still are great for more CX and design-thinking driven projects. Despite the dogmatism and scorn from purists, here’s the truth: there isn’t really a “one-size-fits-all’ delivery model. Even within our organizations, we need different delivery models and processes for different kinds of projects. It’s unlikely that you’re going to use just one of these methodologies. In fact, you’re probably doing it already: you’re method melding. Method melding understands the constraints of the delivery world we’re living in. It’s rooted in the very specific reality of your team, your constraints, your clients, their budgets and requirements—and it doesn’t neatly fit in the Scrum, Kanban, or Prince2 paradigm. Today, digital agencies aren’t using one project methodology—instead, we’re method melding. For digital agencies, methodology melding presents a challenge—it can create confusion and throw a project into disarray. If there’s not a documented process, understandably your teams can get confused, your clients upset, and your projects can end up in even more of a mess than if you’d just stuck to a waterfall approach. In digital products and services, AI algorithms are being used to tailor companies’ products and services in real-time to suit the conditions of the marketplace. Internally, companies are using AI to automate tasks like scheduling, fact-gathering, and data visualization. In fact, AI research teams are building machine learning systems to augment a project manager’s decision-making ability by analyzing data from multiple projects in the project portfolio. It’s taking away the need for project managers to compile data, pull reports, and run scenarios. The growing presence of AI and automation in digital projects highlight the importance of soft skills in our project management and teams. As we become more adept at using the intelligence of machines to handle aspects of our delivery process, AI and automation is changing the role of a project manager—for the good of the project. To remain competitive, successful digital agencies will capitalize on a valuable—but not-so-quantifiable — asset: their project manager’s essential soft skills. The project manager’s people-focused skills are becoming an increasingly important part of the role—being an empathetic listener, anticipator of needs, adept coordinator, tactful negotiator, and motivational leader. To remain competitive, successful digital agencies will capitalize on a valuable—but not-so-quantifiable — asset: their project manager’s essential soft skills. For agencies, fostering the development of emotional intelligence in their project managers and teams will is becoming a key component of business strategy. We find ourselves increasingly bringing on gig workers as part of the project team; the prevalence of remote working, freelancing from co-working spaces, and teleconferencing has already had a major impact on our work environments and procedures. According to the Bureau of Labor Statistics, at least 1 in 3 workers is now earning income from work that is not traditional 9-5 employment. That’s a lot of folks. The growing remote workforce presents new challenges to PMs who manage virtual teams, often working from home and distributed across multiple time zones. Of the current trends in project management, the gig economy has a very direct effect on how agencies operate on a daily basis. Because work is increasingly performed by freelance or temporary workers, agencies find themselves working with a shrinking pool of core, full-time team members. Altogether, this means more odds and ends of people and task management. It’s a challenge to effectively keep work flowing when many of your workers are working their own hours and are not familiar to you, nor with your business strategy or the rest of the agency team. Solving this challenge will require a focus on learning new project management skills for managing remote teams, as well as a knowledge of collaboration tools and workflow software specifically designed to unify a distributed workforce. How to stay relevant in changing times? Understand different approaches for delivery so you understand the philosophical position of your clients, as well as the mindset and ability of our teams. And be honest about where you’re at today. Secondly, you’ve got to light the way. Amidst all the confusion around methodologies and ways of delivering projects, we’ve got to shine a light for our teams on the path that we’ve chosen. That path, and process, should be lightweight, providing just enough organization and structure to get things done without being a burden to anyone. Whatever hybrid methodology you choose, it should fit the needs of your team but it should also be evolving and flexible to enable you to adapt. Yes, it might be rooted in agile and lean principles, but what’s most powerful and important is that your method works, rather than follows the book. What really matters is an understanding that methodologies are just tools to help us think about the process of delivering projects. What matters is to a commitment to doing quality work that meets user needs and delivers great value to your clients. Yes, it might be rooted in agile and lean principles, but what’s most powerful and important is that your method works, rather than follows the book. The best methodology is one that’s continually improving and adapting. It’s an approach that includes strong collaboration in your team and with the client. It’s a methodology that surprises and delights the client by delivering value frequently and getting it right. To do this, you need to be pragmatic (rather than dogmatic) about the methodology you use. Embrace methodology melding. So, keep up with the latest methodologies and how they’re being applied—incorporate flexibility into your project plans so you can test and learn these new approaches. Make sure you know enough about the most popular project methodologies in order to make good decisions about using them. Additionally, pay attention when choosing scheduling and workflow tools. If you’re blending and switching methodologies, you need a tool that can be customized to accommodate the shifts. There’s no algorithm that can replace the project management soft skills of empathizing, actively listening, or tactfully negotiating. We’re using machines to process, learn, and display lots of information, but they lack a critical ingredient in successful project management: humanity. There’s no algorithm that can replace the project management soft skills of empathizing, actively listening, or tactfully negotiating. Are you equipped to do “humanity”? Project management has become much more than managing the iron triangle and ensuring that a project is delivered on time, on budget and to scope. Really great project management is strategic, striving for alignment where a project, a team, and a client are disjointed. It binds a distributed team, it provides motivational leadership, and it skillfully negotiates a safe passage through the icebergs that can sink projects. Ask yourself who’s really the guardian for success for your projects? That person should be your project manager—the one who balances the project and brings everything back to delivering success. And you need to equip and empower them to be successful in that role. If you’re in that role, you need to be on the lookout for ways to build out your essential soft skills to be successful as a PM. You can start by reading this article on managing remote teams, across time zones, who are often working flexibly and on different projects. As you work, pay special attention to your briefing: with less face-to-face check-in, setting your team up for success with clear requirements and extra clear expectations is essential. Finally, you can add structure to a distributed team through the use of tools focused on workflow automation and business process management. Start to own and invest in the social aspects of project management by educating yourself on the role of emotional intelligence in PM. You can also give this podcast a listen: in this episode, we interview PM and emotional intelligence expert, author, and speaker Colin Ellis. Another great resource is Dale Carnegie’s book How to Win Friends & Influence People, a classic for thinking about soft skill development in the workplace. If these project management trends tell us anything about the future, it’s this: we’re not really sure what the future of work looks like. Especially in digital, the paradigm of how we work together, how we develop products, and how we build companies to suit our ever-changing environment is, well, ever-changing. This is why being open to new learning is one of the key success factors for project managers of today. Let’s not get ahead of ourselves, though. No matter what happens, to begin leading change in your digital teams, your fundamental PM skills (or the skills of the project managers in your teams) have got to be rock solid. For this, the Digital Project Manager School is a great place to start, with an online course offering highly relevant, practical, expert-led training for project managers. The Digital Project Manager School web page for the online course Mastering Digital Project Management. 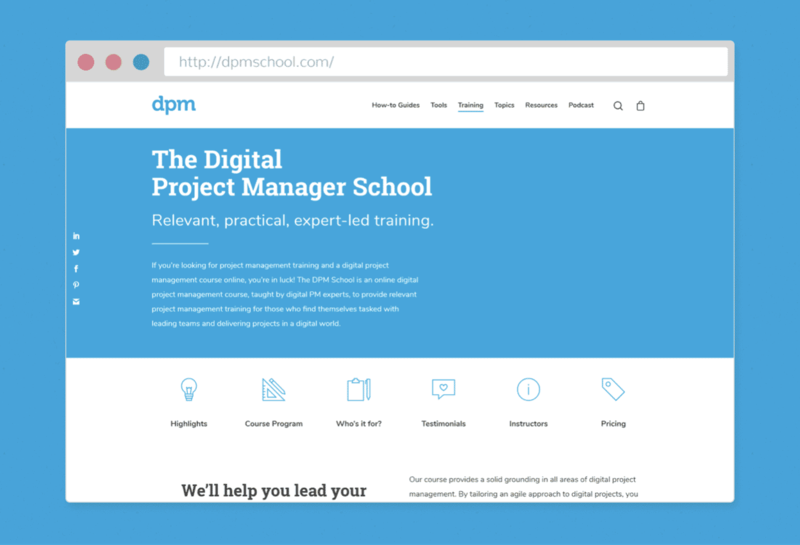 Perhaps most notably, the DPM School’s course program offers the valuable opportunity to bounce questions off of PM experts who are on the ground experiencing the dynamic changes of today’s digital project landscape. The Digital Project Manager School offers highly relevant, practical, expert-led training for project managers. If you’re not sure how your current practices are going to serve your teams, agencies, and clients in the future, The DPM School is the place to start. As long as you’re looking ahead and arming yourself with the best project management skills, you’re steering your team in the right direction. Thanks to TypoArt BS from Shutterstock for allowing me to use this image.